10 Reasons Why French Women Don't Get Fat: Or Is It A Big Fat LIE! 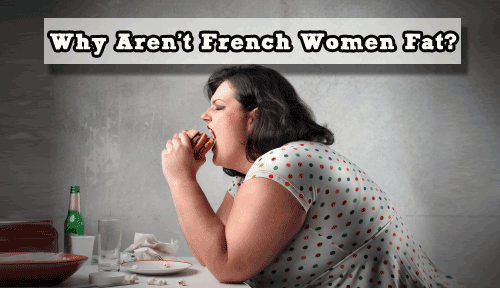 >> 10 Reasons Why French Women Don’t Get Fat: Or Is It A Big Fat LIE! Maybe you’ve heard: French Women Don’t Get Fat! But is it true and if so how does this nation of cheese eating, wine drinking people stay relatively thin? Especially the women? French Women Don’t Get Fat! Is There Scientific Proof? The belief that French people don’t get fat is so strong and so widely believed that some scientists have studied this phenomenon to try to understand how a nation that eats more cheese and drinks more wine per capita than the average developed nation isn’t more overweight. The answer I believe is not in the French DNA but rather in the attitudes and habits the French have with regards to food. On any given day my husband Blake and I can take a walk around France to local shops and Bistros and find middle-aged couples leisurely walking around. Nothing really extraordinary except for the lack of flabby limbs and pudgy waists. The younger French people tend to be even more thin and appear very athletic. Which is even odder since the French are not known for frequenting the gym like many Americans and Canadians do. I can literally go weeks maybe months before I spot a Fat, overweight French woman. When I say fat, I don’t mean chunky or curvy. I mean obese to the point that it’s probably hazardous to their health. Before I go into the why, let me first give you some facts. In 2007, Forbes magazine published an article ranking the worlds fattest countries; 198 countries in total were ranked. The article published these numbers based on (WHO) the World Health Organization. The report reflected the percentage of that country’s population over the age of 15 that was overweight. *NOTE: The WHO’s definitions of “overweight” and “obese” are based on an individual’s body mass index (BMI), which measures weight relative to height. Overweight is marked by a BMI greater than or equal to 25 and obese is defined as having a BMI greater than or equal to 30. In this report, the United States was ranked 9th fattest nation out of 198. Yes 9th. (screeeeeeeeeech, record scratch). 74% of the American population is considered overweight (BMI > 25). Compare that to France which was ranked 128th fattest nation with 40% of the adult population overweight. That’s a huge drop don’t you think? Even more alarming is when you compare the ranking of Americans to Asian nations. Thailand, China and Japan all with 30% or less of their populations overweight. The Asian diet is another story and I would love to talk about their food and culture but today we are only looking at the French diet. Take a look at the partial table below which lists some countries in order of fat rank. It is a partial list, you can see the full list of 198 countries ranking by clicking here. #128 France 40% Why aren’t they at 75% like Americans or 61% like Canadians? Why is it that the French appear so thin and so healthy compared to other countries but especially when compared to Americans in the U.S., a nation obsessed with diets and health clubs? If you have ever spent any length of time in France than the answer to this question may be clear to you but to everyone else, it must seem puzzling. Once you hear the reasons you will nod your head and immediately understand how the French stay relatively thin given their diet of rich foods. Let’s take a look at how the average person shops for groceries. In the U.S. and in Canada, you can walk into any grocery store and be faced with aisle upon aisle of chips, soda pop, Twinkies (edit: not any more because their discontinued), sugar-coated cereals and an abundance of other unhealthy snack foods. Yes these unhealthy choices exist in France but there are two noticeable differences, Portion and Selection. 1- PORTION: Unhealthy snacks are sold in tiny servings that would probably make an American scoff and think they were getting ripped off. You don’t see huge bags of Doritos, or Costco sized coco puffs. 2- SELECTION / QUANTITY: In France the selection and the quantities of flab inducing, stomach bulging foods and snacks are minuscule in comparison to the aisles upon aisles dedicated to these types of food in the U.S. and Canada. A recent trip to the UK didn’t prove any better.. Instead of aisles dedicated to coke and pop and aisles dedicated to chips and another aisle dedicated to cookies, most French grocery stores dedicate less space to these types of unhealthy choices. Portion size and availability of unhealthy snacks only scratches the surface as to “WHY”. Here are 10 more reasons. Through lots of reading and by actually living in France for several years, I’ve witnessed first hand some of the reasons why French woman are able to stay relatively thin. Below are 10 simple explanations which anyone can incorporate into their way of eating. I know they seem silly or easy but they work. Sorry, there is no magic pill to be thin either. 1- Slow Down: The French eat very slowly. You’ve probably heard that by eating more slowly, you give your brain time to catch up to your stomach. When eating at some of the Bistros here in France, I definitely notice that people sit much longer for lunch. They stop and talk to one another in between bites. Put there fork down in between bites. Drink some wine in between bites and then talk some more in between bites. The whole meal can take up to an hour to eat easily. One of my son’s who is 14 noticed the same thing at the French school he attends. French children are not given a mere 45 minutes to eat but close to 2 hours to eat compared to the US where they were given barely 40 minutes to eat their lunch. According to my son, on average, his friends take closer to 40 minutes to finish their meals. 2- Eat Smaller Portions: There is no super size me in France. French restaurant portions are noticeably smaller. Meat and fish portions would be considered tiny by American standards. One easy way for you to cut your portion size is use a smaller diner plate and don’t go back for seconds. 3- Don’t snack: I know that a lot of diets in the U.S. say you should snack but here in France, snacking is virtually unheard of. No bag of chips, no granola bars in between. It’s just not common place. 4- Eat breakfast: The French usually eat 3 meals and never skip a meal, not even breakfast. Breakfast is not like a typical American or English breakfast. No stacks of piping hot pancakes, with a side of bacon and eggs. It’s juice, maybe some toast, an apple or nuts. So don’t skip breakfast just eat lighter healthier in the morning. 5- Little to no processed foods: I already mentioned that walking down the food isles in the U.S. and Canada is like walking down a cornucopia of packaged and processed fatty foods. Not in France. Sure there are processed food but no where near as much as there is in the US and Canada. So skip the process packaged foods and stock up on healthier choices. 6- More Fish, Fruits and vegetables: The French eat more fresh fruits, veggies and fish-so should you. 7- Be more active: What I find amazing is that the French stay so lean but don’t have gyms at every corner like there are in the US. Instead, the French are more active. More outdoor activities, more walking. This is good news for all you people who hate the gym. Try to be more active and walk more. Everyday if you can. 8- Drink red wind: Aaaaah Yeah!!!!!. It’s true that the French drink more wine. The numbers don’t lie and neither do my eyes. While dining out in France, I do notice that more people partake in a glass of wine than in the U.S. or Canada. In the Groceries store too; I see many more people buying wine at the checkout than in the U.S. or Canada. (wine is very inexpensive in France compared to elsewhere). The reason why wine is good for weight loss or weight control is because it contains an antioxidant compound found in the grape skins called resveratrol. It’s not only great as an aid in weight loss but also overall good health. Cheers and you are welcome! 9- Eat yogourt and cheese: What is interesting is that in the U.S. and Canada, milk is almost forced down our children’s throats but here in France, it’s not served to school children- ever. Instead they are served cheese or yogourt with each and every meal and they are served water with lunch. I’m not talking cheddar cheese either (many French people say it’s not “real cheese”). Instead children are served Brie, camembert, compte, Tomme Noir, emmental and a bunch of other cheeses that most Americans don’t even know exist. The only time children are not served cheese is when yogourt is served. Not sugary Danon yogourt or that funky kiddy gogurt. It’s real yogourt. 10. Hydrate with water: The French hydrate with water and hydrate often. I already mentioned that the kids don’t get milk at school. Yes they do get juice on occasion but the kids almost always are served water. If you were thinking about dieting to lose those last 10 pounds then give the French way of eating a try. The best thing about the French way of eating is it is painless and it’s yet another reason why you would love to live in France. At least, I keep telling myself that.